ARCTIC CAT | ASP Group s.r.o. Premium utility, recreational and professional Heavy Duty ATVs, Sport and Utility Side-by-Sides, UTVs and Snowmobiles made ​​in USA. Arctic Cat is one of the world’s largest manufacturers of class-leading All Terrain Vehicles (ATVs), Side by Sides, ROVs, UTVs and snowmobiles. Renown for outstanding durability, robust design and extreme reliability, Arctic Cat ATVs and UTVs bring high level of quality, robustness and class leading performance for customers demanding highest standards and value for money. Arctic Cat ATVs are also used in different military services. Official distributor of Arctic Cat ATVs, Side-by-Sides and Snowmobiles for the Czech Republic, Slovakia, Poland and Romania - ASP Group Distributing, has been awarded in 2012 as the Best Arctic Cat ATV Distributor in Europe. From a wide range of Arctic Cat utility ATVs lineup you can choose from professional hard-working or versatile utility/recreational models, between single-seaters or 2-Up models with longer wheelbases and two comfortable seats, from medium to Big-bore engines - Arctic Cat has what you want. And no matter which Arctic Cat utility ATV you choose, all offer top-level quality, superb handling, smooth ride, reliable powerful engines with high pulling power. The choice is yours. As a company that brought UTV world to a whole new levels of quality, design and handling we exactly know what our customers want. And we deliver it to them: hard working machines for both work and fun, with superb maneuverability, unique joy of riding, high speed stability, large cargo bed and great pulling power. Arctic Cat engineers are professionals just like you, they love speed and adventure, every day they are testing Arctic Cat UTVs in same tough conditions as you do. And all this so that you can fully enjoy highest quality and excellent performance of Arctic Cat sides-by-sides and UTVs. Arctic Cat has been inseparably associated with snowmobiles since its beginnings, when the company was founded in 1962 by "Father of snowmobiling" Edgar Hetteen. Over the years that followed Arctic Cat has firmly established itself as one of the world's leading snowmobile producers. From an extensive Arctic Cat snowmobile lineup with nearly 60 models we have selected utility sleds which are best suited to European conditions, with wide tracks and plenty of pulling power ideal for mountain resorts deliveries, for ski lifts maintenance or grooming of cross country trails, and some of the best high-performance racing and sports sleds - hi-tech beasts with more than 160 HP. Our customer care does not end by sale and delivery. We offer professional after-sales service and fast delivery of original spare parts. We constantly strive for high professionalism of sales and service staff in our strong dealer and service network. With more than 400 locations all over the Central and Eastern Europe we are always close at hand when you need us. We permanently hold an extensive stock of original spare parts and accessories at our central warehouse in Letkov near Pilsen, so we can deliver them within the shortest possible timeframe. With Arctic Cat genuine spare parts you can be always sure that they will fit, are designed to the exacting manufacturer´s standards and work better and last longer than aftermarket parts to keep your ATV in best possible operating condition. 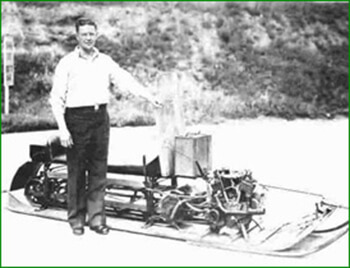 Arctic Cat Inc. was formed by legendary snowmobile pioneer Edgar Hetteen. Its history spans back more than 55 years to date. Arctic Cat today ranks among the world´s largest and most successful snowmobile / ATV manufacturers, producing range of more than 30 ATV and UTV models in many engine displacements a year, and more than 60 snowmobile models in various line-ups, packages and track lengths. Important milestone in the history of Arctic Cat was expanding its operations in Europe in 2001 by establishing European headquarters in Austria and successful completion of EU WVTA homologations for Arctic Cat ATVs/UTVs. 1954 - Edgar Hetteen, skilled and inventive technician, creates at that time totally unique machine which was capable of travelling on snow – “Sno-Cat" later called "Sno-Traveler“. Edgar Hetteen, along with his brother Allan and brother-in-law David Johnson forms Polaris Industries Company in their hometown Roseau, Minnesota and manufactures first snowmobile propelled by rear-end four stroke engine. 1960 - Sales are rising, but in the management of Polaris Industries comes to friction: Hetteen wants to concentrate on snowmobile business while other members of the board of directors kept pressuring him to nix the unknown new snowmobile product and to keep production of plows, mould boards, weeders and other farmers equipment. Edgar Hetteen sells his majority stake in Polaris Industries and founds whole new company Arctic Enterprises in the nearby town Thief River Falls, Minnesota. 1962 - Birth of Arctic Cat. Hetteen, later renowned as “Father of Snowmobiling", develops Arctic Cat 100 - the first snowmobile of a modern concept with front-mounted engine, which brought the company huge success. For the first time his snowmobiles were called Arctic Cat. 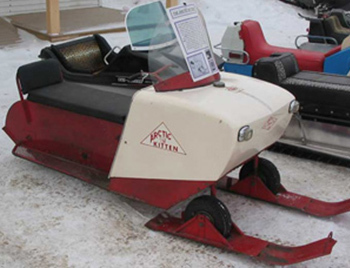 In years to follow Hetteen continually introduced number of technical innovations that transformed early bulky "snow machines” into the effective and easy-handling snowmobiles. 1964 - Arctic Cat Deluxe changes once and for all construction of snowmobiles by introducing a revolutionary lightweight fiberglass removable hood instead of heavy steel one-piece construction. 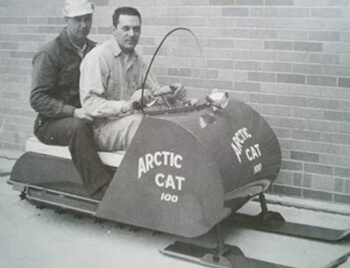 1971 - Arctic Cat BossCat I with 1000 HP engine sets world snowmobile speed record by reaching 203 km/h. 1978 - For his vast experience is Edgar Hetteen named first President of International Snowmobile Manufacturers Association (ISMA). 1983 - Company overcame big snowmobile crisis in the eighties when couple of brown winters stopped sales in USA. Thief River Falls factory again starts production of snowmobiles under the Arctco brand. Arctic Cat celebrates 100,000th snowmobile rolled off the assembly line. 1996 - Company finally changed its name to Arctic Cat Inc. and introduces first Arctic Cat ATV - the Bearcat 440. Bearcat 440 was immediate success thanks to high ground clearance and long suspension travel. During years that followed Arctic Cat ATVs were rapidly evolving thanks to continuous technical development and innovative solutions. 1997 - New Arctic Cat Bearcat 454 4x4 is another great success on the market, with the most powerful engine, longest suspension travel and highest ground clearance in the class. 1999 - Arctic Cat launches first ATV with automatic transmission - Arctic Cat 500 4X4 Automatic. 2001 - Arctic Cat is the first ATV manufacturer to produce ATVs for leading farm equipment manufacturer Massey Ferguson. - Due to constantly increasing importance of the European market Arctic Cat opens its European headquarters in Austria. 2002 - Arctic Cat introduces a revolutionary fully independent rear suspension without SwayBar stabilizer. 2004 - Arctic Cat 650 becomes ATV of the Year in the USA. 2006 - First Arctic Cat Side-by-side launched: recreational/utility Prowler 650. 2007 - Arctic Cat has opened its own new modern engine manufacturing plant in St. Cloud, Minnesota. 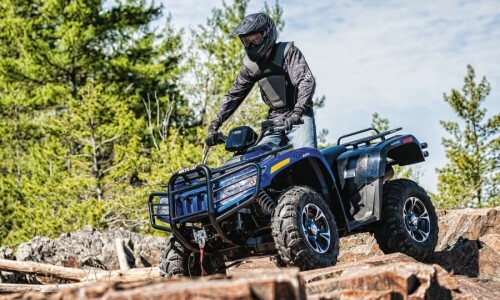 - Arctic Cat ATV introduces revolutionary diesel-powered ATV - 700 Diesel. - Arctic Cat has reached milestone in ATV production: on September 25, 2007 the company produced its 500,000th Arctic Cat ATV at its main manufacturing plant in Thief River Falls. 2008 - Arctic Cat unveils Thundercat 1000, ATV with the biggest engine in the world. - Side-by-side Prowler wins the toughest American race Baja 1000 in UTV category. ASP Group s.r.o. becomes the official authorized ARCTIC CAT distributor for the Czech Republic and Slovakia, later also for Poland and Romania. 2009 - Arctic Cat receives large contract from US Army for supply 700 Diesel ATVs. - Arctic Cat Thundercat 1000i wins ATV category in the legendary American Baja 1000 race. - Arctic Cat Thundercat 1000i wins Baja 1000 race for a second time. - Company's turnover first time exceeds half a billion dollars. 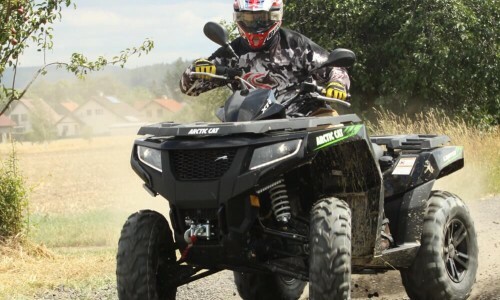 - Arctic Cat ATV's became the top-selling premium brand in the Czech Republic. 2011 - Arctic Cat celebrates the brand's 50th Anniversary since Edgar Hetteen founded Polar Manufacturing in Thief River Falls. Since that time Arctic Cat has become one of the world's largest ATV, UTV and Snowmobile manufacturers. 2012 - Introduced the revolutionary extreme-performance Wildcat 1000, at that time the most radical sport Side x Side in the world. 2013 – Launched Wildcat X - even more radical version of Wildcat 1000i with improved suspension even more extreme performance. Arctic Cat Wildcat is awarded "Quad of the Year 2013" by leading German magazine ATV & Quad. 2014 – ASP Group s.r.o. is honored by prestigious "Arctic Cat Circle Of Excellence Award" as the best European ATV distributor.